"Detailed stereo image analysis with 3D visualization." 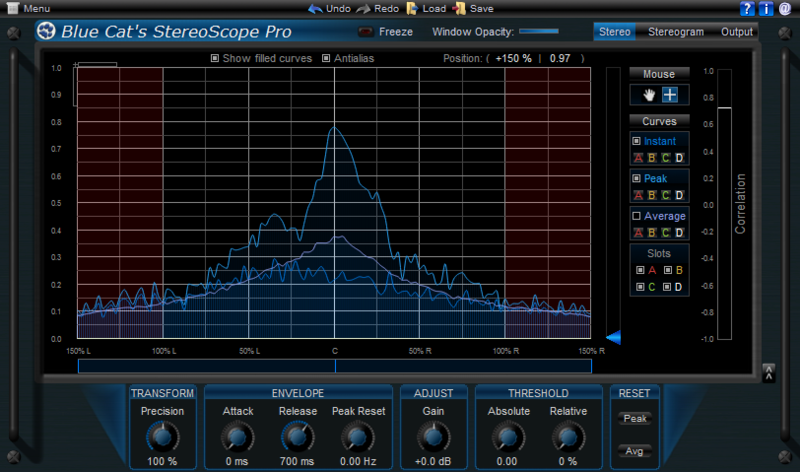 - Blue Cat's StereoScope Pro is a real time stereo field analyzer with multiple views and MIDI/automation output capabilities. It is a powerful help to analyze how the audio signal is spread in the stereo field, and you can easily detect potential phase and mono compatibilities issues. Detailed stereo image analysis with 3D visualization. Any VST or DirectX compatible host application. ...... Choose your preferred view for your needs: real time stereo field display, evolution of the stereo image over time (2D or 3D) or output parameters that explicitly describe the average position and extent of the audio signal in the stereo field. The 3D waterfall view lets you see in details from your preferred viewpoint the evolution of the stereo image over time. The four memory slots let you store any curve in memory: it helps you make comparisons between several tracks or effects setup very easily. You can compare your mix with other commercial hits! Like our other professional analysis tools, the output parameters of this plug-in can be used to control other effects in real time: the generated automation envelopes or MIDI CC messages include the minimum and maximum positions in the stereo field and the perceived position based on the audio energy spread in the stereo image. Qweas is providing links to Blue Cat's StereoScope Pro 1.82 as a courtesy, and makes no representations regarding Blue Cat's StereoScope Pro or any other applications or any information related thereto. Any questions, complaints or claims regarding this application Blue Cat's StereoScope Pro 1.82 must be directed to the appropriate software vendor. You may click the publisher link of Blue Cat's StereoScope Pro on the top of this page to get more details about the vendor.